Educate communities about the signs, symptoms, and risk factors of ovarian cancer in order to facilitate early detection of this deadly disease and save lives. Provides support and resources to those touched by ovarian cancer including survivors, patients, caregivers and families. Aids in the advancement of scientific research for ovarian cancer. 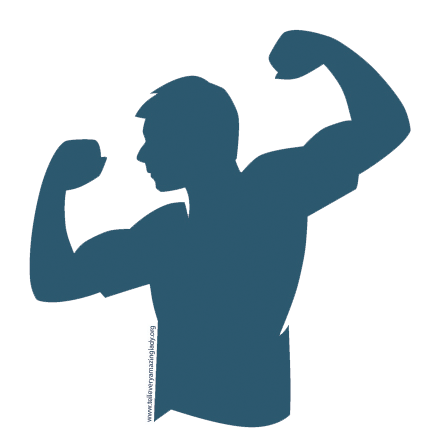 Apply to become a beneficiary by filling out this RFP application. * Free T.E.A.L.® Workshops offered at the T.E.A.L.® headquarters in Brooklyn are now available! Learn more about these workshops for survivors, families, & the general public here! The Men of T.E.A.L.® promote awareness and education for the spouses and relatives of women with Ovarian Cancer. The program aims to bring relief by helping men address the many tremendous obstacles in supporting a loved one. 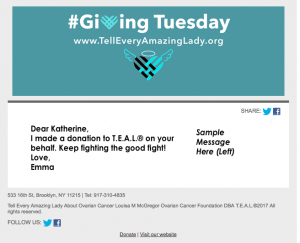 T.E.A.L.®’s national and local programs function on the principle that awareness and education of Ovarian Cancer is empowering, and understanding this deadly disease is the first steps toward fighting it. Throughout the year, T.E.A.L.® actively engages with the community to provide information about Ovarian Cancer and to address this important women’s health issue through health fairs, symposiums, and lectures at schools, universities, community centers, and hospitals. T.E.A.L.® prints over 30,000 pieces of printed educational material per year to distribute throughout various communities. T.E.A.L.®connects with local and national media to get the message out across as many channels as possible. This includes aggressive online awareness campaigning using our website, social media channels, and e-mail blasts to over 250,000 people. T.E.A.L.® programs include our Survivor Programs, the T.E.A.L.® Walk/Run Program in Brooklyn and cities across the USA, and Awareness and Education Programs which include our Community Outreach Program, September Awareness Program, Virtual Fundraiser Program, Scientific Research Beneficiaries Program, Annual Ovarian Cancer Awareness Day at Citi Field, and more. T.E.A.L.® Survivor Programs include our Tell Every Amazing Lady® Clinical Trial Navigation Service, our Survivor ceremony, and survivor booth at ourAnnual Brooklyn T.E.A.L.® Walk/Run. T.E.A.L.® helps fund and support Survivor Educational Courses Program through Foundation for Women’s Cancer, Share Programs, and the Survivors Teaching Students® Program through OCNA. T.E.A.L.® offers assistance in finding cancer support groups, fertility support, financial advice, diet and nutrition, and any required help that address the needs of Ovarian Cancer survivors or their caregivers through the collaboration between our office and our partnerships. T.E.A.L.® offers programs that provide support and resources to Ovarian Cancer patients, survivors, their caregivers and families. We are constantly in the community participating in health fairs, symposiums, and lectures at schools, universities, community centers, hospitals, community meetings throughout the year to spread awareness about Ovarian Cancer to address this important women’s health issue. Our T.E.A.L.® CEO is often invited as a guest speaker to spread awareness of the signs, symptoms, and risk factors for Ovarian Cancer at these events. T.E.A.L.® chose six of Ovarian Cancer survivors to photograph in order to spread public awareness about Ovarian Cancer. These Ads were displayed throughout NYC on subway platforms, kiosks, and buses in addition to local business and community centers. This Ad campaign reached over 7.76 Million people in 2014. In 2012, T.E.A.L.® helped establish the Annual Ovarian Cancer Awareness Day at Citi Field for a NY Mets game. T.E.A.L.® turns the stadium teal, drawing attention to the color and the cause. A PSA is given at the beginning of the game addressing Ovarian Cancer. A portion of each ticket sold from T.E.A.L.®’s own ticket window benefits T.E.A.L.®. On March 15th, 2014, the Metro State Roadrunners of Colorado organized the Strikeout Cancer campaign in honor of a player who was recently diagnosed. Softball and Baseball players wore teal jerseys at their joint home games to raise awareness and money for Ovarian Cancer. Roadrunners exceeded their fundraising goal and raised almost $1,200 for T.E.A.L.®! On October 3rd, 2014, the Thornsbury Family of Land O’Lakes Florida joined T.E.A.L.® in our fight against Ovarian Cancer. They were able to raise over $600 for T.E.A.L.® through their T.E.A.L.® Bake Sale at their daughter’s Karate School and their virtual fundraiser page on our website in memory of their beloved sister in law. T.E.A.L®. helps fund partnership programs at schools and hospitals, in New York and the Metropolitan area to educate students, survivors, and those at risk. In the future, with more funding, we will be able extend our survivor appreciation efforts, support services, and T.E.A.L.® Programs.